Legend has it that the River Styx was the last barrier in the soul’s trip to Hell. In this version however, Hell has burned itself out. Other myths and icons, such as the cherubic cloud and the tree of life are explored in this startling display of sculptural figures, which ranges from 7-foot processional images to tiny characters struggling in a fantasy landscape. Story-texts and instructions for physical manipulation of the puppets are used to engage the viewer in an active relationship with them. 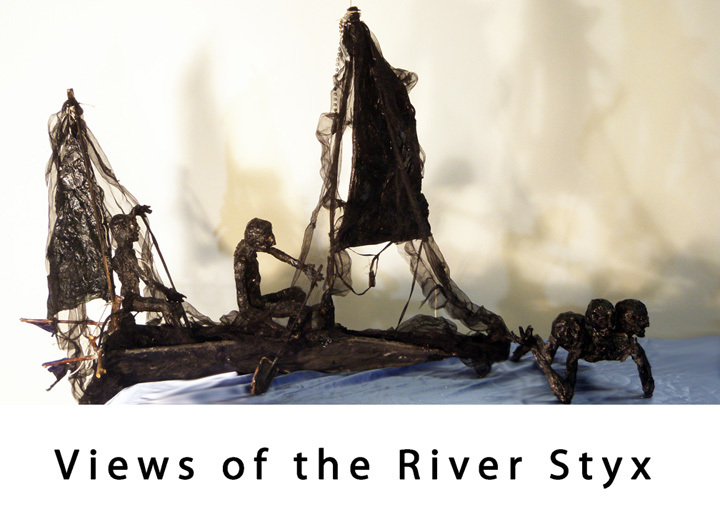 Francesca Borgatta makes her art work with recycled materials, combining natural elements with cast-off detritus. She was a member of Peter Schuman’s Bread and Puppet Theater in NY. As Artist-in-Residence in schools and community centers she teaches art and designs on-site installations using available materials. 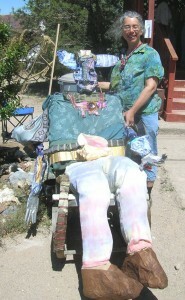 She exhibits her work widely and uses her puppets for protest and celebration.